Case Western Reserve University is a private university in Ohio. The university in Cleveland is currently ranked as 37th in the U.S. and has produced 17 Nobel laureates over the years. The heart of the CWRU campus is the Tinkham Veale University Center, opened in 2014. Lovingly called “the Tink” by staff and students, this hub houses multiple campus departments, university offices and various event spaces. The Tinkham Veale University Center is the heart of the Case Western Reserve University campus. Modern technology is an obvious companion to the building’s modern design. Just inside the entrance is a huge media wall — a two-storey, multi-touch video wall that is used for various communications. This wall has recently also become the home of the CWRU social media wall, as the university wants to bring the campus together not just physically in the “Tink” building but also virtually with the help of social media. We talked to Nicholas Hobbs, Box Office & Marketing Manager of the Tinkham Veale University Center, about what the social media wall is doing for CWRU. What are you hoping to achieve by using social media walls and hashtags? Every department on campus is posting cool and interesting content on their events and research. Our building is the Tinkham Veale University Center and is somewhat of a central hub for the whole campus. Since so many people pass through our building, we wanted a way to display all of this information to them in an innovative and relevant way. This is when my colleagues and I decided that the social walls would be the best option. 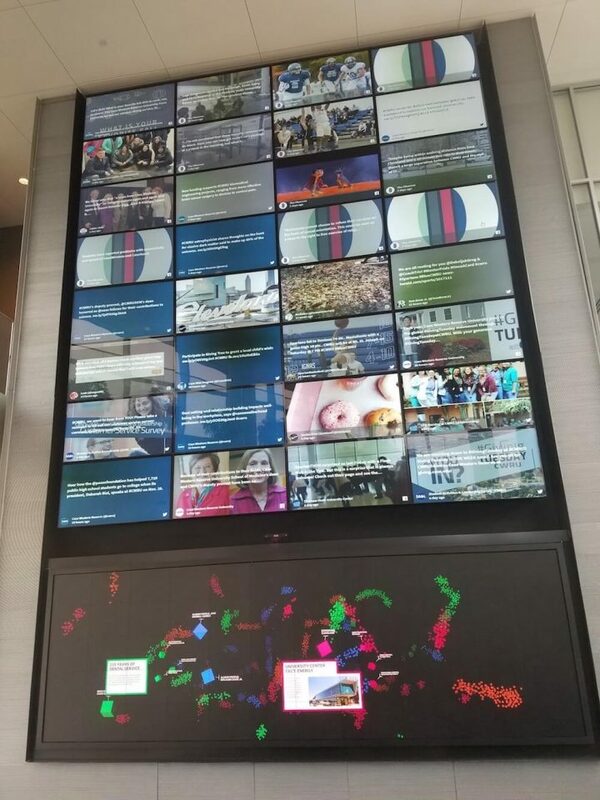 Our media wall, on which the two social walls are displayed, is designed to keep the Case community informed and connected to all that is happening on campus and in the greater Cleveland area. It is the very first thing you see when you walk into the “Tink”. The large media wall is the first thing visitors to the Tinkham Veale University Center see when they enter. Schools can use social media to promote events, make announcements and engage students to share their experiences with the world. You’ve set up two walls with Walls.io. What purposes do these they serve? 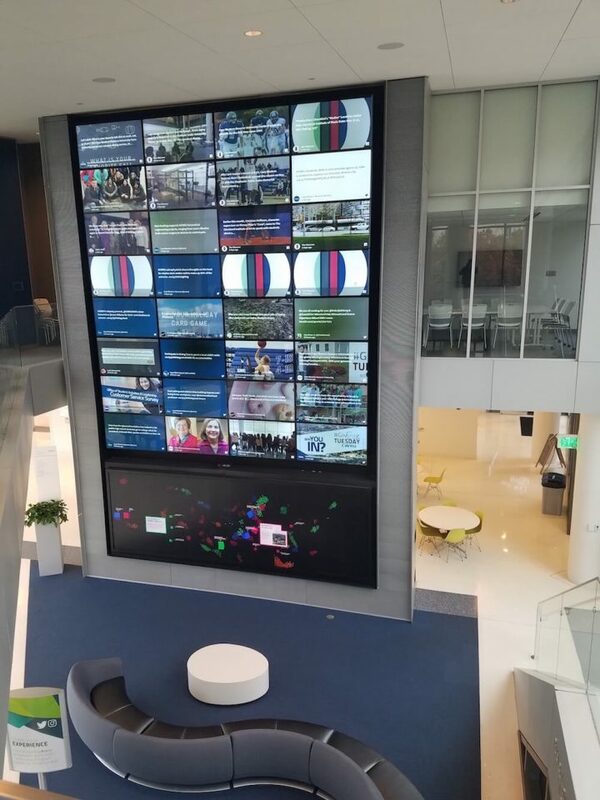 Our walls are designed to display content that is pertinent to the campus of Case Western Reserve University. The walls are loaded with social media accounts and hashtags that are either campus departments or topics I believe are important to the Case family. There are a lot of departments on campus that post interesting content so we needed two walls to just scratch the surface. I also wanted to include hashtags that are from Cleveland as a whole, such as #thisiscle. The two walls are mostly similar, but one is slightly more informative while the other I have tailored more towards images. Your media wall looks absolutely gigantic! We’d love to know more about the setup, how you’re using it in general and how your Walls.io wall fits in with this. The Media Wall was designed with the core mission to innovate, inspire and connect all of our guests. The top portion is referred to as the Beacon and is composed of 32 Christie LED panels. The bottom portion is referred to as the Touch Wall and is composed of 60 Christie microtiles. And since the Tinkham Veale University Center is a LEED-certified Gold building, the entire wall was designed to only use 5800 watts of power which is quite impressive for its size. The top part of the media wall in the Tink is referred to as the Beacon, the bottom part is called the Touch Wall. The wall is fed information from a laptop that we have stationed in an AV room. We have placed our Walls.io walls on the Beacon portion of the wall so that they are striking and visible. We feel that social media is a great place to highlight and to connect with the mission of the Media Wall. What are your main hashtags and how are you motivating people to use them? There are a few hashtags and departments we like to display frequently. Our most common departments are: the student newspaper, the Observer; the Alumni Association; the Maltz Performing Arts Center; and the University pages. Our most used hashtags are: #cwru, #thisiscle, #casewestern #universitycircle. The department pages are posting frequently so we do not need to advertise for their posts. 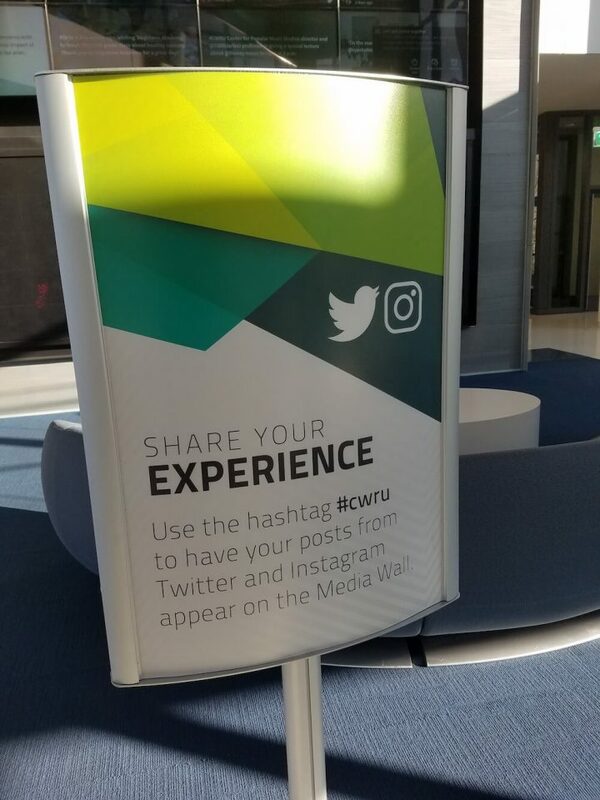 With the hashtags, we have placed signs around the Media Wall to encourage our guests to post with the #cwru hashtag to see their content displayed on the screens. A sign placed by the media wall encourages students, staff and visitors to use the #cwru hashtag. You’ve set up a lot of sources and are getting a lot of content. How are you handling moderation of your wall? What kind of workflow have you set up? The moderation of the wall is an ever-changing process. When we began, we were under the misguided belief that the wall could operate with automatic approval of all the sources we had listed. I want to say, within 4 hours of our launch, we learned that the content would need to be manually approved; we are on a University campus with students. So I now have everything that is displayed manually approved, either by myself or some of my student employees. I try to approve posts 3-4 times a day. If you want to have a lot of different sources on your wall and/or are dealing with a potentially volatile group of users, i.e. students, the Walls.io manual moderation can help you keep your social media wall “on brand”. It’s more work then letting it run on auto, but you’ll be rewarded with a perfectly curated social media wall! When did you start using social media walls and for how long will this project run? We just began with you all in August. The project has been a HUGE success, and I now get constant requests from all over campus, asking to display certain department accounts or hashtags. We feel that the walls are the perfect way to enact the mission of the Media Wall, so we will continue with them as long as you all will have us. Many of our competitors charge for social walls on a day-by-day basis. Our pricing tiers are set up in a way that allows you to use Walls.io for however long you want to: get an event wall for 72 hours or one of our affordable monthly subscriptions which can be cancelled anytime. Has the social media wall changed your marketing strategies in any way? This is the first time the “Tink” has used any sort of social media wall. It has been a success and has affected the way we market, and the way other departments market. We will occasionally change the sources to just the hashtags of a specific conference or event we are hosting. Our clients love to see their event hashtags displayed in such a visible way, and it has given us a few brownie points with some of our larger rental clients. I now accept requests for specific accounts to be a source or specific hashtags. We absolutely love how CWRU has made Walls.io a malleable, flexible part of the university’s marketing. After all, a social media wall doesn’t have to become a static thing — on the contrary! You can easily change your sources based on your organisation’s calendar, adapting to conferences, events, sponsors, etc. 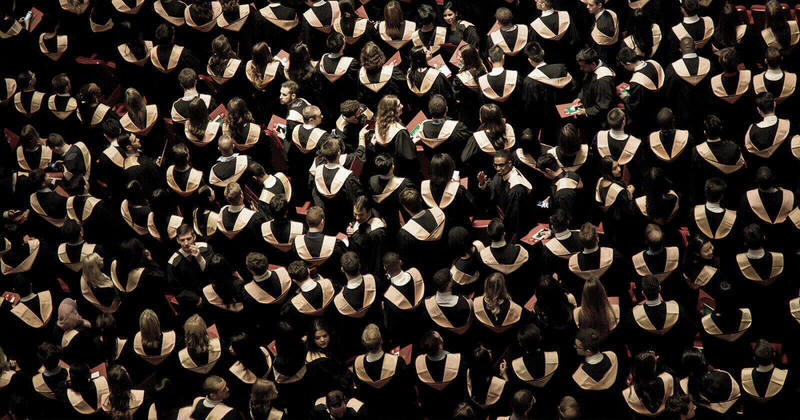 Make good use of your social media wall by making it the crown jewel of your educational institute’s marketing. Display it prominently in a public space and aim to bring together news, tidbits, events, achievements and appreciation posts from all departments of your university. Students and staff will bond over the shared social media wall and donors will appreciate it as well. Nicholas has chosen to add a large number of accounts, keywords and hashtags to his Walls.io sources to include a large proportion of the CWRU campus. To counteract the huge amount of posts coming in, he is putting extra effort into moderating and approving posts manually. It takes commitment to do this, but using a large variety of sources and then moderating by hand allows him to showcase the diversity of posts being shared all over such a large university.